Fansipan cable car is the good chance for everyone to admire and conquer “the Roof of Indochina”. - The temperature decreases and colder than usual when you go higher, so you should carry a jacket, scarf and warm hat. Beside travelling by cable car, you have to walk 600 steps to reach the top of Fansipan so you should wear low heeled shoes to go easily. - Fansipan Sapa have temple system, you should wear discreet and polite clothes when you go to spiritual and sanctuary place. 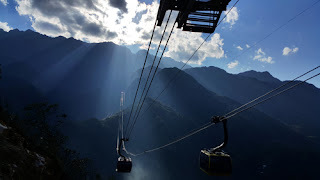 -The people with respiratory and heart problems, or afraid of heights should be encouraged not go to Fansipan by cable car to ensure the health. Up to Fansipan’s peak, the air is very weak, you should rest for the body to adjust to the temperature and climate. - You do not carry toxic chemicals, explosive materials and prohibited substances to the cable car. - Do not bring food from outside to the cable car (you can carry a little water). You can use the services available at the cable car. - In the cabin, you are stable and do not move when the cabin operate (especially with children). During operation process, if have wind, the cable car could sway lightly a little bit, but tourists do not be afraid because it is a very normal thing. With the experience that we share, hopefully the visitors can get the perfect journey of discovery the Roof of Indochina. 0 Comment to "WHAT NOTICE WHEN TRAVEL TO FANXIPAN BY CABLE CAR"